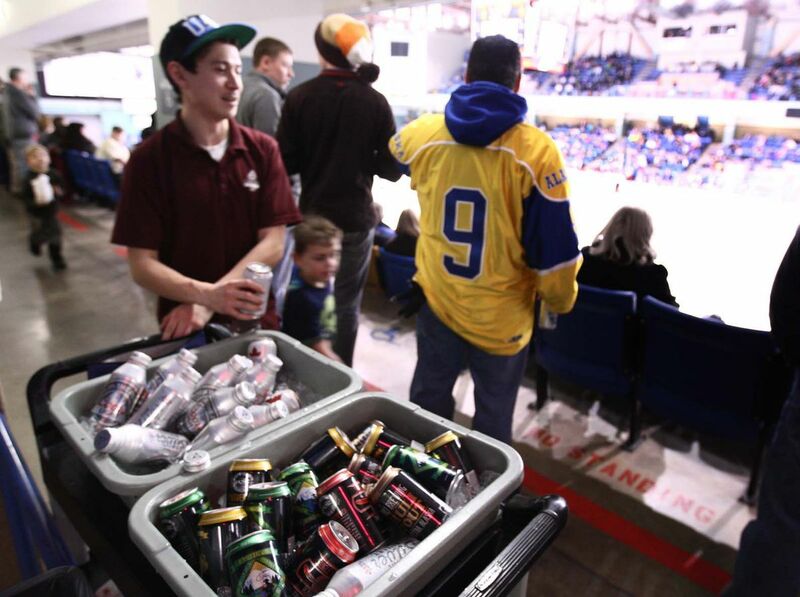 Beer and wine is served at Alaska Nanooks hockey games at the Carlson Center as an attendance draw and revenue source as the alcohol section is sectioned off with signs during a game Friday night, February 5, 2016. FAIRBANKS — Alaska has a problem with alcohol misuse, and residents are increasingly aware of it — a crucial step in addressing the related health, social and economic impacts. While vastly complex, subjective and little studied, public perceptions of alcohol consumption are key to finding a solution to Alaska’s rate of alcohol misuse, which is among the highest in the nation. “Public perception matters significantly. These perceptions are formed most often by the language we use to describe alcohol, the things we hear about in the news and in our neighborhoods, and is influenced heavily by our experiences in our own homes and with our own family members and friends,” Mat-Su Health Foundation Executive Director Elizabeth Ripley said in an email to the News-Miner. “These experiences translate into our understanding of ‘what is normal.’ …When we change people’s perceptions, demonstrate what is normal and what is not in terms of alcohol consumption, people change behavior,” she said. Quantifying the role alcohol plays in human nature is impossible. Intoxicating drinks have been around for millenia, are ingrained in human culture and are not going away. The National Council on Alcoholism and Drug Dependence reports alcohol as the most commonly used addictive substance in the United States, with one in 12 adults suffering from alcohol misuse or dependence. According to a 2012-13 survey of almost 1,800 Alaskans conducted by Healthy Alaskans 2020 — a consortium of state agencies that determines health priorities and sets target goals for improvement — alcohol use is the No. 1 health issue in the state and scored a “very concerned” ranking. In Healthy Alaskans 2010, substance abuse, including alcohol and illicit drug use, ranked fourth in residents’ leading health indicators. In the Fairbanks North Star Borough, 57 percent of the 1,300 people surveyed in 2014 for Healthy Fairbanks 2020 identified alcohol misuse as the primary health concern facing the community. The idea that alcohol consumption is widespread throughout society is nearly impossible to argue. Popular music extols the pleasures derived from drinking both day and night. When potable water is unavailable, societies have historically turned to alcohol as a safe substitute. Nonprofit fundraisers are often accompanied by spirits in hopes of loosening purse strings — something many organizers deny or decline to speak about publicly. The Daily News-Miner and other media outlets run spotlights on breweries, distillers, Oktoberfest and Alaska Beer Week. Alcohol ads adorn everything from gas pumps to sports stadiums, where beer and spectating go hand-in-hand. 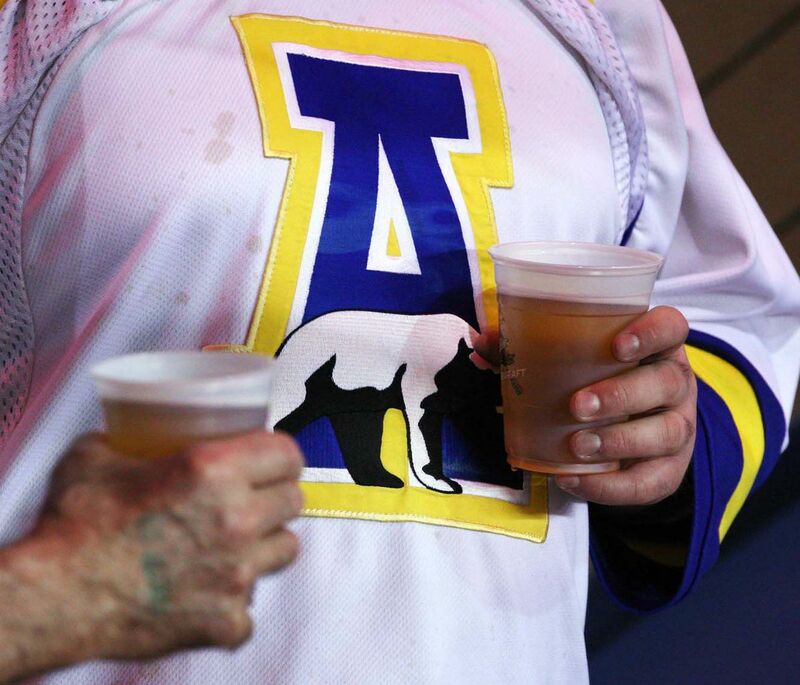 Just last year, the University of Alaska Fairbanks opened almost half of the Carlson Center to beer sales and consumption in stands at Nanook hockey games. 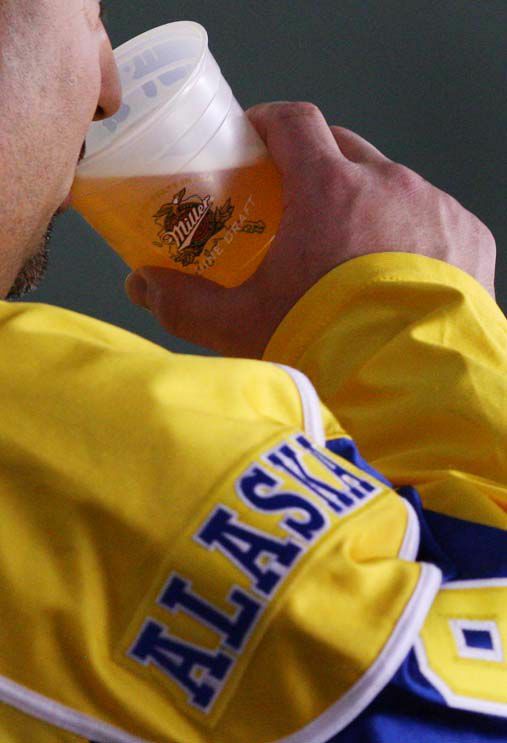 In an email, UAF spokeswoman Marmian Grimes said beer sales were expanded “to enhance the fan experience by allowing fans to have beer in their seat while they watch the game.” The decision was based in part from a survey of Carlson Center users and “was not done lightly or quickly.” Grimes added that all profits from beer sales reside with management company SMG. These factors and myriad others all shape societies’ collective perception on alcohol. Perceptions can act as risk factors or protective factors — positive or negative. For example, regarding heavy or binge drinking, defined by the National Institutes of Health as four drinks for a woman and five drinks for a man in less than two hours, people can think it’s harmful (protective behavior), not harmful (risky behavior), or somewhere between. How people perceive the consumption of alcohol is just one factor to be considered by those working to reduce alcohol misuse and overuse. The public perception of alcoholics is often in the far end of the stereotype scale — that alcoholics are vagrants, according to Recover Alaska Executive Director Tiffany Hall. “When people think of an alcoholic, they think of somebody who is homeless, asking for money on the side of the street. It’s easy to perceive them as the lowest end of the society scale. At one point they were just like you or me,” Hall said. Recover Alaska, which financially supports the News-Miner’s “Paths to Recovery” series, is a group of stakeholders formed to reduce the harm caused by excessive consumption of alcohol through policy, statutory and practice changes. Hall thought her drinking was in line with her peers and not a problem. She thought everyone drank all the time — until she realized her peers drank in large quantities but not necessarily in high frequencies. “I was drinking all the time compared to other people,” she said. Hall’s perception of her peers parallels a study by the National Institutes of Health that investigated the effect social norms have on drinking. The 2010 study was titled “Group Identification as a Moderator of the Relationship Between Perceived Social Norms and Alcohol Consumption.” The report states that perceptions of how much or how often others drink “are among the best predictors of college student drinking” but also that young adults “consistently overestimate the quantity of alcohol consumed and frequency of drinking of their peers,” a demographic Hall fell right in the middle of. So the amount young adults think their peers drink directly correlates to the amount they consume, even though that perception is often wrong. Differing views from alcohol, health workers Part of Hall’s slow realization that she had a problem may have originated in the lack of definitive boundaries on the alcohol use and abuse spectrum that defines problem drinking. A man or woman who rarely drinks could cause problems every time they consume, while someone who drinks frequently — perhaps even binge drinks — may cause no problems. “For some people, alcohol use is reasonable, it doesn’t cause negative consequences to them or their families, and that may or may not involve five or more drinks in one sitting,” said Kate Burkhart, executive director of the Advisory Board on Alcoholism and Drug Abuse at the Alaska Department of Health and Social Services, in an email response to questions. Burkhart points to the change in perception that substance use disorders are now generally accepted as health care issues instead of character flaws. “Twenty years ago, the idea that addiction is a disease was not something that was accepted in the health care community or the general public,” she said in a separate phone interview. Burkhart’s and Hall’s views on problem drinkers are shared — to a point — by Dale Fox, president and CEO of Alaska’s Cabaret, Hotel, Restaurant and Retailers Association, or CHARR, a lobbying group for the hospitality industry. “Inside those derelict alcoholics that aren’t functioning in society is a great person,” he said. “There’s a great, productive Alaskan in that soul.” But Fox thinks some organizations, including Recover Alaska, vilify the alcohol industry and establishments that sell alcohol. “We know the problem drinker gives the industry a black eye; it’s a small percentage and only takes one,” he said. Burkhart agrees, “It’s important not to demonize folks who use alcohol responsibly,” she said. 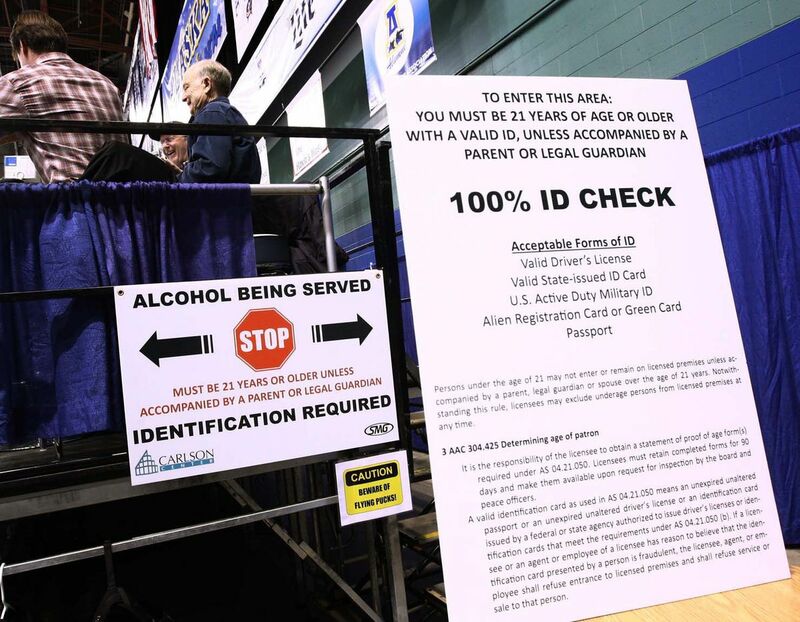 One contentious arena where the alcohol industry and health care professionals don’t often agree is taxes and regulations — the former being particularly prominent with Alaska’s ongoing budget crisis. According to Clark, “taxes on alcohol have been shown to reduce consumption,” a claim Fox doesn’t buy. “It’s a societal problem. The alcohol industry is paying way more than its share already,” he said. Parents positively or negatively influence a child’s perception of alcohol in many ways, including through the parent-initiated “sip.” Be it a holiday, religious ceremony or family dinner, many children receive their first taste of alcohol from a parent. A recent study of 1,729 Australian seventh-graders and one of their parents attempted to examine the role sips and tastes may play in future alcohol consumption. Published in the journal AAP Gateway March 2016, “Parents Who Supply Sips of Alcohol in Early Adolescence: A Prospective Study of Risk Factors” followed parent-student dyads for one year. One of the recently targeted populations is Alaska’s young people. Alaska Wellness Coalition’s Be [YOU] campaign aims to educate young people about the drinking habits of their peers by accurately portraying statistics on alcohol use. 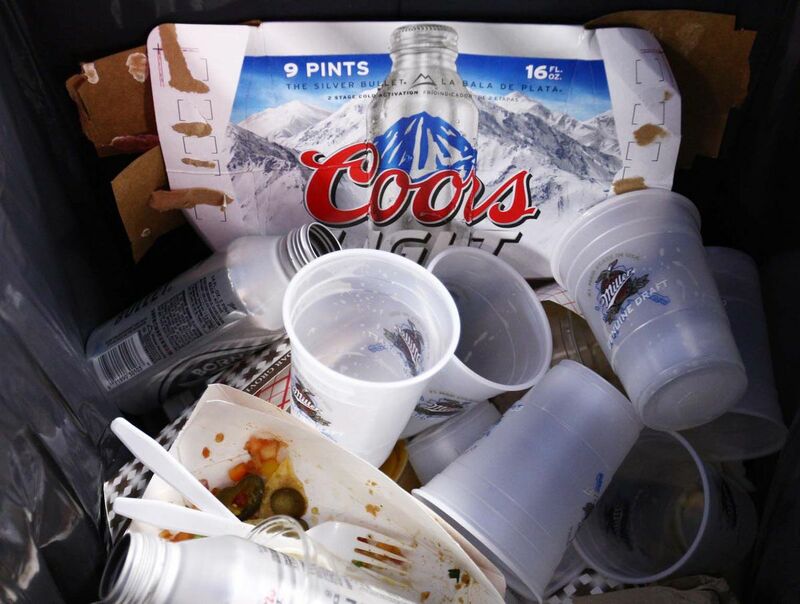 The campaign claims that 79 percent of high school students think their peers drink alcohol. But almost the same number, 78 percent, report not drinking. The goal of Be [YOU] is to highlight the real number of teenage consumption “and move public perception closer to the norm, which is actually positive, not negative in this case,” Ripley, of the Mat-Su Health Foundation, said via email. The foundation is a financial supporter and partner of the Alaska Wellness Coalition and a partner in the Recover Alaska Media Project fund. Without the perception campaign, it’s possible teens would think their peers drink at higher rates than in reality, which could result in a risk factor based on inaccurate information. Though more of a preventative service and community outreach program than perception campaign, educating and changing adults’ perspectives is the goal of a 2013 project started at Alaska health care facilities in conjunction with the University of Alaska. Someone visiting a public health nurse — say for family planning or STD testing — also faces a set of questions to identify drinking patterns under the Screening and Brief Intervention program, or SBI. The SBI program was designed to be “an area to move, as a community, to create that greater awareness of alcohol use,” according to Fairbanks Public Health Center Nurse Manager Laura Kolasa. Now, during every meeting with a public health nurse, patients are screened for alcohol use and misuse. The brief intervention might simply be a conversation about the patients’ pattern of alcohol use, or information about what constitutes a serving of alcohol. “Some of the things we have had the opportunity to talk about with clients is what is considered a serving of alcohol, or a safe amount of alcohol to consume within a week? People don’t always have a good understanding. … We have found that to be a really helpful process,” Kolasa said. Hall, the executive director of Recover Alaska, appreciates strangers’ curiosity if they ask her why she doesn’t drink, but she dislikes pity. “Try not to be so awkward.” Hall did experience shame and guilt for being an alcoholic, “because that’s how society sees it.” She encourages simply continuing conversations. Shirley Lee, of the Tanana Chiefs Conference’s Housing First project, will be the session’s moderator. Community leaders and members of the public are invited to offer suggestions or to attend to simply become informed. TCC, the city of Fairbanks, Fairbanks Native Association and Fairbanks Memorial Hospital have recently sought state funding to begin a sobering center feasibility study. You can learn more about sobering centers in a Jan. 31 Paths to Recovery story, online at http://bit.ly/1UZKgec. You can find all of the News-Miner’s Paths to Recovery stories online at www.newsminer.com/news/akrecovery. The story of Alaska’s relationship with alcohol is far from over. That’s why the Daily News-Miner’s reporters and photographers have been spending some of their time over the past year on a grant-funded project titled “Paths to Recovery: Solving Alaska’s alcohol problem.” What you see in today’s edition of the News-Miner is another installment of that project, which is a partnership between the newspaper and the Recover Alaska Media Project Fund at the Alaska Community Foundation. The purpose is to focus public attention on, and cause discussion about, possible solutions to the alcohol problem and to highlight — and learn from — the successes that have so far been realized. Contributors to the Recover Alaska Media Project Fund include the Alaska Mental Health Trust Authority, Rasmuson Foundation, Mat-Su Health Foundation, Southcentral Foundation, Providence Health & Services Alaska and Doyon, Limited. Recover Alaska is providing major funding for the News-Miner’s “Paths to Recovery” project, as it did with the “State of Intoxication” project produced by the former Anchorage Daily News. That project looked closely at the causes and impacts of alcohol misuse in Alaska. The News-Miner’s project extends that by looking further at the search for solutions. What’s especially important to note here is the News-Miner has sole responsibility for the selection and editing of all content produced as part of this project. Nothing produced by the News-Miner is submitted to anyone outside of the News-Miner for prior approval. In the end, the goal has been a simple one, although the problem is complex: We hope, through this project and the related independent efforts of the Recover Alaska team, to provide information so Alaskans and their leaders can make decisions that will put this state on the best path in the fight against alcohol misuse. Contact staff writer Robin Wood at 459-7510.